This is something that everyone from either side WILL watch and make a further opinion on. Lil Kim fans- Does the Bee tell Minaj what time it really is? Nicki Minaj fans- Is Kim trying to stretch her last 15 minutes of fame? Wether this was Kim plan to be re-welcomed into the hip hop circle, or even if she is genuinely upset, everyone knows that you DO NOT bring others into a fight! The full audio of Lil Kim’s new record “Black Friday” premiered early yesterday morning in the US on New York’s Hot 97. In the diss track, aimed at Nicki Minaj, Lil Kim name drops Drake, Lil Wayne & Diddy…. 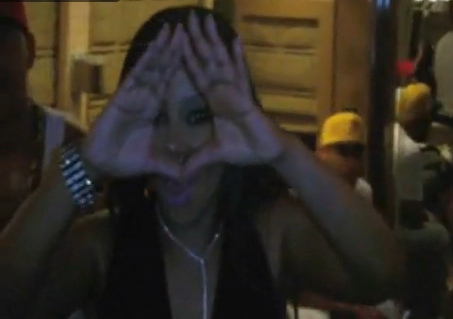 Lil Kim signs to Roc Nation!! Lil Kim has officially reclaimed her name in the rap game by recently signing to Jay-Z’s label Roc Nation!! As as she has been making here presence on the hip hop scene known, unfortunately for the Queen Bee everything doesn’t seem to be as cool as it should be in the game between her and newest female rapper Nicki Minaj. To give you the low-down, Lil Kim doesn’t seem to be too impressed with the way the Nicki has blown up on the rap game, all over the globe, and has not… paid The Bee, no homage. Now this issue has been watched, listened to by the public which has formed two different opinions, so I’ll try my best to keep you up to date, with the help of some footage too. Nicki has just come into the game, and from what we have all seen and heard from her, picking at her style, her flow and personality doesn’t take a genius to work out who the collective of artists are being combined, rolled and compressed into Minaj. What do you think of the situation unfolding as we speak? What team do give your support to and why?